Quick fact; Children are being diagnosed more than ever with ADHD. If your child has received this diagnosis and is having a hard time with following directions at home, behavior management is an approach that can help. If done properly, your child be more successful with the rules and expectations at home, out shopping, or wherever you may travel. A major component of implementing behavior management at home is following through with what was said. If you do not follow through, this technique will not work. Children with ADHD need simple rules that they can understand. When teaching your child the rules, it will be best to write these rules down. If your child is able to read, post the rules where they can read them, such as on the fridge. You may also use pictures to illustrate or demonstrate rules. Through posting the rules, they will be more consistent and the child can be reminded of the rules on a daily basis. No matter how much your child may be upset with you when you follow through with these rules, stay consistent. A child with ADHD needs immediate rewards and consequences. This will help the child understand what type of behavior is desired and what is not. In giving immediate feedback, make sure it is specific and direct so the child understands why they are getting the consequence or why they are getting the reward. A child with ADHD needs a consistent reaction to behavior. When you react consistently, your child is more able to recognize a desired behavior. Remember, changing a behavior will not happen overnight, it will take months of consistency in order to change an unwanted behavior of a child. Establishing routines with your child will help with changing unwanted behaviors. Establish specific times for when your child will complete their homework, eat dinner, and go to bed and stay consistent to those times. Routines help with behaviors because your child will know that every day, at a specific time, they will be expected to do a certain task. A parent that has a child with ADHD can usually predict when behaviors may occur. Use this to your advantage; develop a plan for what you will do when your child exhibits an unwanted behavior. When you have developed a plan, share this plan with your child and other adults that interact with your child. Discussing a plan with your child will help your child understand consequences of unwanted behavior. Through discussing a plan with other adults that work with your child, consistency can be reinforced no matter who is working with your child. A behavioral management plan can help your child with ADHD succeed if it is well thought-out and reinforced with consistency. Maintaining consistency through routine, establishing consequences/rewards and utilizing a plan to counter unwanted behaviors, positive change can be achieved. As a parent or teacher, what other tips do you have regarding behavior issues? Please comment below! This entry was posted on Sunday, March 18th, 2018 at 10:57 pm and is filed under Special Education - Parents View and tagged as McKenzie Wickham, Special Education Behaviors. You can follow any responses to this entry through the RSS 2.0 feed. Behavior issues can be one of the most dreaded aspects of parenthood. Sometimes the behaviors can completely consume a household and significantly increase the stress level felt by the entire family. 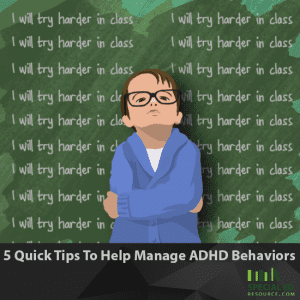 These 5 Quick Tips To Help Manage ADHD Behaviors is a great place to start and can rapidly be implemented!